I am officially jumping on the pumpkin bandwagon. No shame. It’s all about embracing the things that you love. Is it #basic to love fall, pumpkin, and yoga pants? Maybe, but that doesn’t mean you have to feel bad about it. Whatever brings you joy, own it! Ok, motivational rant done. My one pet peeve about pumpkin is that I never use an entire can at one time. I also never seem to remember this every year when fall comes around. I stock up on multiple cans of pumpkin, only to realize that each recipe I find only uses maybe 1/4 – 1/2 cup at a time. Then I’m left with more than half a can of pumpkin and have to scramble around finding other recipes to use it in. Does this happen to anyone else? The easiest thing for me to do with leftover pumpkin is to throw it in a blender with a few other things and make a smoothie. I made this one the other day after a workout and was able to get in a good amount of protein and carbs which are important for muscle recovery. It is SUPER easy to make. Do it. Add all ingredients to the blender. I like to add any powders first to avoid explosions. Both the protein powder and the chia seeds help add protein to this smoothie. You can even make it into a pudding by adding 1-2 Tbsp more chia seeds to help thicken it up. Enjoy! 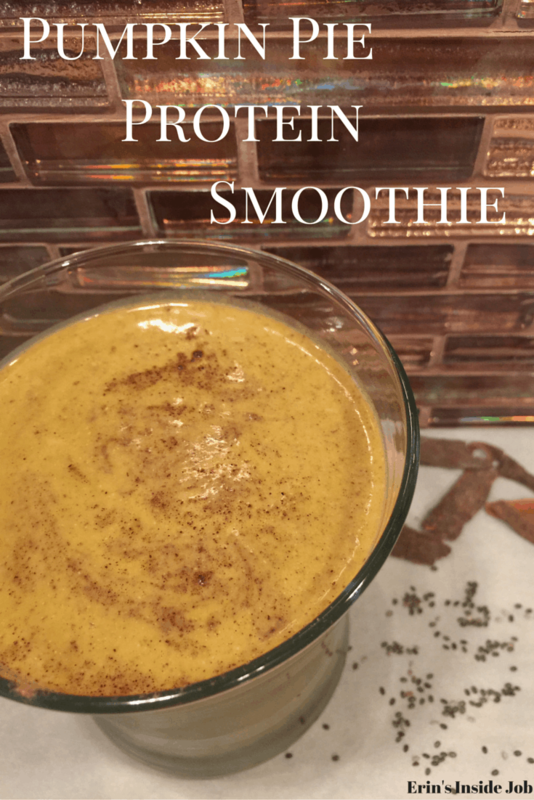 Pumpkin pie protein smoothie: a perfect way to use leftover pumpkin and refuel post workout! Like this recipe? Pin and share it with others who love pumpkin! P.S. Are we connected on Pinterest? Lots of other smoothie recipes to choose from! On a scale from 1-10, how basic are you? No really, I’m asking. I don’t know! Saving this to make myself- look awesome! It’s pretty good and not overly sweet! I am pretty basic, especially where recipes are concerned. This looks great! Yeah for pumpkin after workout drinks! I might be able to live on pumpkins in the fall! I know right?! What CANT it be used for?